Since hearing about the the nightly Last Post ceremony at the Menin Gate at Ypres in Belgium I have always wanted to experience it and had also promised my dad that I would video it for him. We drove from Gravelines across northern France and eventually into Belgium. We arrived at a small aire about 2kms away from The Gate which cost €8 with electric hookup. There was space for 16 motorhomes but only two or three of them would accommodate our 9m length. The aire was at Zillebekevijver…. try saying that after a few pints! As part of this tour we wanted to visit some World War I military cemeteries and as we approached the entrance to the aire, we noticed one on the opposite side of the road to the aire entrance. Michelle standing at the entrance of the Railway Dugouts cemetery across the road from the aire. We decided to walk down into the town to get our bearings. Its a pretty straightforward flat walk into the town and the first thing you see as you approach is the huge Menin Gate. A bronze poppy wreath stands in front of the Menin Gate looking through towards the town centre. The Menin Gate Memorial to the Missing is a War Memorial dedicated to the British and Commonwealth soldiers who were killed in the Ypres Salient of World War I but whose bodies have never been identified or found. The memorial was unveiled on 24 July 1927 and is located at the eastern exit of the town and marks the starting point for one of the main roads out of the town that led Allied soldiers to the front line. Its a hugh imposing monument which has the names of 54,395 missing soldiers carved in stone slabs according to their Regiment and Rank. A central archway on each side of the gate leads to steps at the rear of the memorial. All the walls around these steps and on the rear of the memorial are also carved with missing soldiers names. The endless lists of names is mind numbing to think of the number of soldiers killed during the battles around the Ypres Salient who have never been found. The steps themselves are lined with poppy wreaths from the thousands that are left each year during the nightly ceremonies. One of the central arches leading to steps which are lined with poppy wreaths including these two from North Irish regiment. On completion of the memorial it became apparent that there wasn’t enough room for all the names of the dead and missing to be recorded as originally planned. The 15th August 1917 was chosen as a cut-off date and the 34,984 UK soldiers missing after this date were inscribed on the Tyne Cot Memorial to the Missing instead. Remains of the war dead are still being found in the countryside around Ypres. They are given a proper burial in one of the war cemeteries in the surrounding area. If the remains can be identified, the relevant name is removed from the Menin Gate. Every evening at 8.00pm buglers play the last post as an expression of gratitude to those who gave their lives for Belgium’s freedom. Hundreds of people gather to see the ceremony, some bring wreaths which are laid on the steps of the memorial during the ceremony. Seen in real time as opposed to a YouTube video, it is a very moving and emotional experience. We were surrounded by people from all over the world who had come to pay their respects and to see a ceremony that has taken place every night since 2 July 1928, except during World War II during the German occupation. Groups of school children gather to watch and learn of the sacrifice made by millions to secure their freedom. I managed to get video of the last post and the reveille for my dad – he would have loved to have seen the ceremony but hopefully this is the next best thing. We had a look around the rest of Ypres including the obligatory cathedral visit. First one of this year. As usual the hustle and bustle of the city stops at the door, the quiet and solitude is palpable, even though there are many tourists inside. I love stepping into a new cathedral – they all have the same things in them but no two feel the same when you sit for a while. St Martins cathedral, Ypres was finished in 1370 but was badly damaged during World War I. Subsequently the site was cleared and the church entirely rebuilt using the original plans. The Cloth Hall in the centre of Ypres was built in the middle ages – it is one of the largest commercial buildings from that time and was the main market and warehouse for the cities prosperous cloth industry. 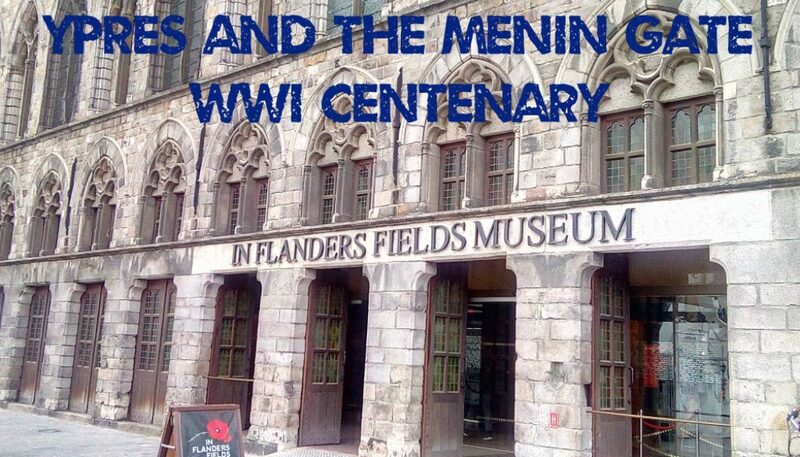 As with the cathedral, the cloth hall was destroyed during World War I and was rebuilt now housing the In Flanders Fields Museum. In fact the whole centre of Ypres was destroyed during the war and then rebuilt to the same designs as the original buildings. As a sad part of modern commercialisation, a large London Eye style Ferris wheel complete with central video screen blaring out music has been installed in front of the Cloth Hall and the In Flanders Fields Museum ruining the view of this beautiful building, especially at such a significant time approaching the 100th anniversary of the Armistice. Who makes the decisions to allow such things to happen? Shame on you. Why not have placed the Ferris wheel in the car park away from the main buildings? Next day we visited the military cemetery opposite the aire (The Railway Dugouts Burial Ground). Apart from the sheer number of identical white headstones, the thing I noticed is how well looked after the military cemeteries are. The grass is neatly trimmed and small shrubs are planted around the gravestones. This is all part of the superb work carried out by the Commonwealth War Graves Commission. When time and the weather wear away the inscription on a gravestone, it is taken away and replaced with an identical new one, so every headstone is like new and more importantly readable – so important for families to be able to find their loved ones final resting place. Significantly there were also a large number of headstones that simply said “A Soldier of the Great War” whose names are probably recorded on the stone slabs of the Menin Gate. It is impossible to fathom the scale of death and destruction of the Great War. In this cemetery alone lies the remains of more than 2400 British Commonwealth soldiers and this is only one of more than 1000 cemeteries dotted around France and Belgium created and looked after by the CWGC. As well as this there are numerous large memorials to the lost soldiers without any grave of which the Menin Gate is only one. We would like to return here to discover more of the area around Ypres and Belgium as a whole. We didn’t get a chance to visit the Irish Peace Park, where there is built a round Irish tower in memory of all the soldiers of Ireland who died in the first world war. The tower was only recently built because of the political turmoil in Ireland throughout and after the war. In the park there are nine stones carved with prose from serving Irish soldiers during the WWI. Three of these probably sum up the horror of the time. So here, while the mad guns curse overhead, and tired men sigh, with mud for couch and floor, know that we fools, now with the foolish dead, died not for Flag, nor King, nor Emperor, but for a dream born in a herdsman’s shed, and for the sacred scripture of the poor. As it was, the Ypres battleground just represented one gigantic slough of despond into which floundered battalions, brigades and divisions of infantry without end to be shot to pieces or drowned, until at last and with immeasurable slaughter we had gained a few miles of liquid mud. So the curtain fell, over that tortured country of unmarked graves and unburied fragments of men: Murder and massacre: The innocent slaughtered for the guilty: The poor man for the sake of the rich: The man of no authority made the victim of the man who had gathered importance and wished to keep it.